For challenge 8 of Freshly Blogged we were tasked with creating a recipe using art or an artist as our inspiration. Unlike the contestants I did not look to a world famous artist for my inspiration, instead I turned to my late gran who inspires me every day. She was a commercial artist and taught me all about water colours, oils and charcoals. She not only taught me how to draw, the taught me to appreciate books and how to get absolute pleasure from reading. Every time I slept over I was allowed to take a book with me to read in bed before lights out. I would have to show her my clean hands and then she would allow me to unlock the book case and take out a hardcover book with short stories in them. I am not sure if I got to read all the volumes before she died and sadly I do not have access to the books to check. My grandmother was an inspiration in other ways as well. She raised 4 boys as a single mother and every Friday night there would be roast chicken and all the trimmings served for Shabbat dinner. I always remember an abundance of food on her side table. This tradition of roast chicken carried on long after she died, in my parents home, with my father allowing me to carve the chicken when I was old enough. I always stuff my chicken with lemon, herbs and garlic and so when I got the challenge ingredients I decided to make something different than what I would normally do. 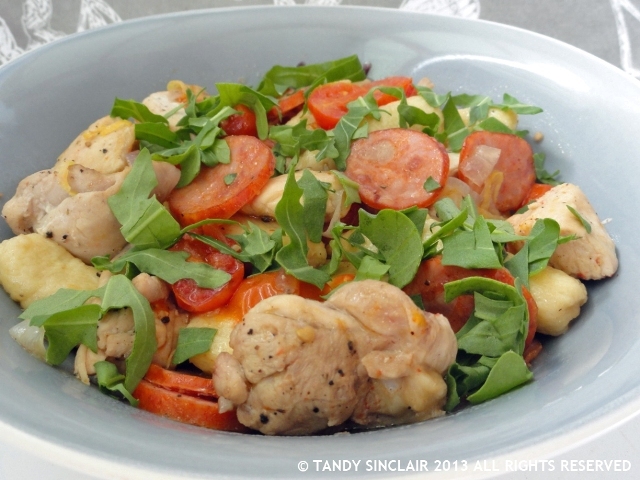 I chose to make gnocchi with chicken and chorizo. I was chopped from the competition before I submitted this recipe but I was not worried as I knew it would be good for my blog regardless. The same day I was chopped I checked to see what my first challenge would be with the Daring Cooks and saw it was for gnocchi. We were tasked to make potato gnocchi and top it with any sauce you choose. How lucky for me! Once blanched, you can toss the gnocchi in vegetable oil to prevent sticking if you don’t want to use them straight away. They can now be frozen. G’day! In one word YUM, true! Wish I could taste some and congrats on completing the challenge too! G’day and in one word, YUM, true! Congrats on completing the challenge and LOVE the flavor combination and wish I could try some of your gnocchi now too! Just love those flavour combinations. Yum! Oh my! This sounds absolutely amazing. I’m always looking for new ways to make chicken. This is perfect! Thank you so much Anne, I hope you enjoy it! Looks gorgeous, chorizo in anything is always good. We’re having gnocchi today….I think I’ve got the ingredients to test out your recipe. It sounds delicious. Wow. I like the combination of all three main ingredients! I am mad for gnocchi, Tandy, and this looks like a really wonderful way to serve them. Thanks! This looks so full of flavour Tandy. I love the fresh flavours and the sherry sauce would make it so yummy! I really do have to learn how to make my own gnocci.